Brucellosis is an infectious disease caused by the bacteria of the genus brucella. These bacteria are primarily pathogens of animals and they cause disease in different vertebrates. Various brucella species affect goats, sheep cattle, deer, elk, pigs, dogs and several other animals. Human beings become infected by coming in contact with animals or animal products that are contaminated with these bacteria. In humans brucellosis can cause range of symptoms from mild flu-like illness to severe infection of central nervous system or lining of the heart. It can also cause long lasting or chronic symptoms that include recurrent fevers, joint pain and depression. It is called as undulant fever in humans characterized by drenching sweats in the night, undue fatigue, anorexia, loss of weight etc. 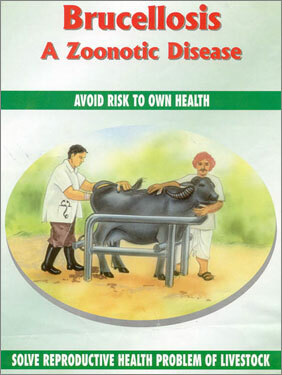 Goat, cattle, buffalos and sheep are the common sources of human infection. B. melitensis gives rise to severe form of infection. B abortus produces mild flu like infection. B suis produces suppurative lesions. Brief and uncomplicated cases of B canis infection occurs in veterinarians, dog handlers, dog owners. The acute symptoms include lassitude, headache and muscular or articular pain. Drenching sweats at night are characteristic. Shaking chills follows extreme prostration. 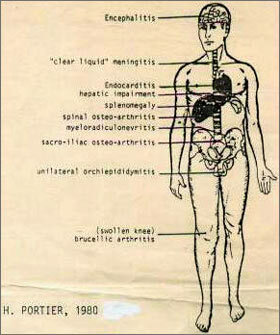 Spleenomegaly is usual and the liver may be palpable. Lymphadenopathy is not a constant feature. Evening raise of temp is observed. Natural recover usually occurs in 1 to 3 months with usual recurrences. That is the reason why brucellosis is called a undulant fever. In acute cases death may occur as a result of extreme toxemia, throbocytopaenia, endocarditis or other serious complications such as disseminated intra vascular coagulation. The brucellosis is called Chronic when it persists or recurs over a period of 6 months or more. The symptoms are attributed to recurring influenza. Anxiety or depression is common in long standing brucellosis besides the usual symptoms. Palpable spleen is a noteworthy sign. Complications include thrombophlebitis, epididymo-orchitis, spondylitis especially lumbar region, and peripheral arthritis of hip, knee, and shoulder. However multi system involvement can take place. In domesticated and wild animals the important clinical manifestation is late abortion. The usual complications associated with abortions, like retention of after birth, secondary bacterial infection, adhesions, secondary infertility are frequently encountered. 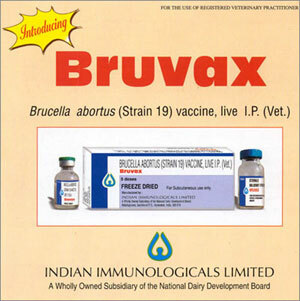 In uncomplicated brucellosis abortions may not take place In the subsequent times, still the brucella are present in the genital discharge and contaminate the environment, thus constituting a source of infection to man and animals. As clinical diagnosis of brucellosis is difficult laboratory aid is inevitable. The bacterial tests consist of isolation and identification of the organism. This is a very hazardous process and can be attempted only is specialized laboratories where containment measures are present. Serological test include, Standard tube agglutination test, Agglutination test with added 2-mercaptoethanol, Coomb's antihuman globulin test and the compliment fixation test. Special tests like radio immuno assay, ELISA, PCR test are also in vogue. Demonstration of the organisms by microscopy, and the serological tests are the common methods of laboratory diagnosis of brucellosis. Koster's, Macchiavello's or Stamp's modification of Ziehl-Neelson stain are used for the microscopic demonstration brucella from tissue and other specimen. The fluorescent antibody method increases the specificity. Tube agglutination test, plate agglutination test, Rose Bengal test, compliment fixation test, Enzyme immunoassays, PCR test are used for the diagnosis of animal brucellosis. Previously oral tetracycline was given 6 hourly for 6 weeks in 500 mg doses, together with intra muscular streptomycin in dose of 1.0 gram daily for a three weeks. Better results and acceptability are achieved with 600 to 900 mgs daily in combination with Doxycycline 200 mg daily for 6 weeks. Co-trimoxazole is also effective. Diet rich in proteins, and vitamins should be ensured. In domesticated animals treatment is not recommended.